This issue again marks an organizational and aesthetic shift away from the DIY, alternative press qualities of the earlier issues to a more traditional, professional-looking journal/magazine layout. In terms of content, its significance lies in the many interviews with women from across the film industry, from screenwriter Eleanor Perry, wife of Hollywood’s Frank Perry, to the members of feminist film co-op New Day. Once again, the new commitment to women’s independent filmmaking results in discussion of soon-to-be canonical works like The Amazing Equal Pay Show (1974) by the London Women’s Film Group; Yvonne Rainer’s Film About a Woman Who… (1974); and the films of Chick Strand. 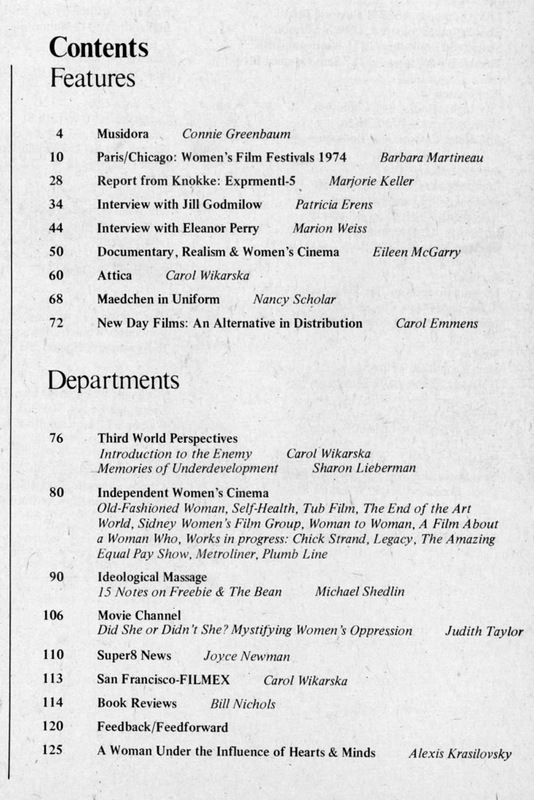 PDF of Women and Film, no. 7 , entire issue. 55 M large file.